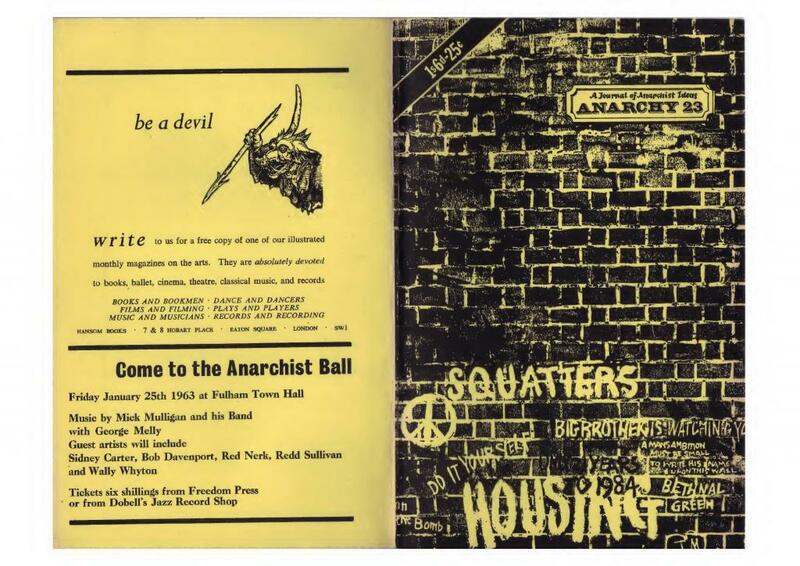 Issue 23 of Anarchy magazine from January 1963 on housing and direct action. In the second half of the twentieth century we have reduced able-bodied fully employed people to homelessness; we never managed this before we decided that housing should be regarded as a social service. In the second half of the twentieth century a man made nearly £3 million profit in seven years from an investment in land of £35,000; no one did quite so well as this before we adopted planning powers. In the second half of the twentieth century the man who gets the greatest State aid with his housing is the owner-occupier millionaire; this was not so in the days of privilege, before we promulgated the Welfare State. Market research can now predict the demand for new products within a few per cent; and we have a slum-clearance programme based on figures that show Welwyn Garden City with the same proportion of unfit houses as Stoke Newington, Cheltenham with the same proportion as Swindon, Carshalton with the same proportion as St. Pancras. The first serious effort to see that the most money goes to the areas in the greatest need has been taken in the 1961 Housing Act; and the Act works in such a way that Bournemouth qualifies for a higher subsidy than Liverpool. The Government has deliberately reduced the building of council houses in the belief that, except in special cases, private enterprise can do the job better; and virtually no private housing is being built for rent.